A "few good machines" go a long way.
" The machines make the parts, We make the furniture ". As I describe in more detail in the Philosophy section, we are not impressed by the strident claims of some that it is the use of "hand tools" that imparts quality to their work. We are doubly skeptical of a shop that offers a broad line of furniture through a multitude of dealers that insists that its work is indistinguishable from "handmade"
We use machinery only to the extent that it will enhance the quality of the finished product and relieve us from some of the drudgery associated with repetitive production of mundane components. Our time, talents and efforts are best spent on design and detail. We also spend at least 30% of the total time invested in a piece on the finishing process. To suggest that a part or component is inherently "better" because it was produced with hand tools is ludicrous. For a company to associate itself with handmade furniture, and keep to a schedule of hundreds of pieces a month is equally absurd. We are a five person shop, Michael, Judy, and our three children. Jennifer and Alana are 29 years old, Christopher is 27. We manage and live on a 160 acre Tree Farm in a rural setting in Arkansas. 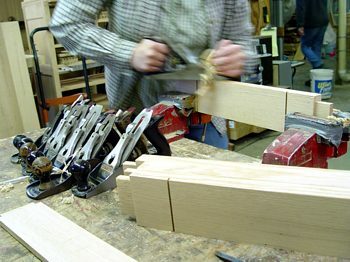 We spend our time handmaking Arts & Crafts furniture, about 200 - 300 pieces a year. We run a small sawmill and a 5000 bd ft dry kiln. 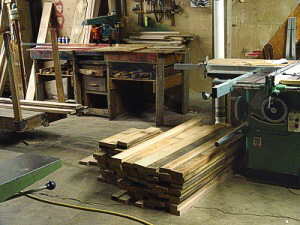 Our 6000 sq ft shop has many of the production machines necessary to turn the rough lumber into quality furniture parts. Those parts are hand selected, detailed, and finished then assembled into furniture one piece at a time. Besides the requisite machinery and power tools for ease of production of quality parts from rough lumber, there are a dozen hand planes and hundreds of chisels, scrapers, saws and other hand tools necessary to detail and hand fit the pieces together. Our work is individually "handmade" in every respect. We expend all the time necessary to assure an attractive, stable, and durable piece of furniture. 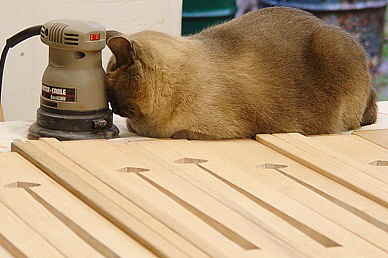 We never leave a machined surface on any part of a piece of furniture. If the part has not been hand planed, it is hand sanded to 320 grit with random orbital sanders for a flawless finish. The final finish is composed of over 8 distinct applications of finishing material. We use the finest finishing products available. Many of the processes that we use are acknowledged among experts to be the best. They are not used in the furniture industry, or for that matter, by most individual craftspersons. The reason is simple. They are too time consuming and require the close attention of a dedicated person to succeed.